Ok, I've been working on this for nearly a week, and it's officially time to release it into the wild. Remember back in cataclysm (or was it Wrath?) when Frostheim introduced the hunter community to our new Haste Plateaus? Well it's that time of the game again, when we get to think about the minutia of stat values and rotations. The theory says that haste plateaus are a practical thing that informs two hunter decisions: the big one is that haste plateaus suggest when it’s a good idea to adjust your rotation, pushing back your signature shot a bit to get in an extra steady/cobra/arcane shot. 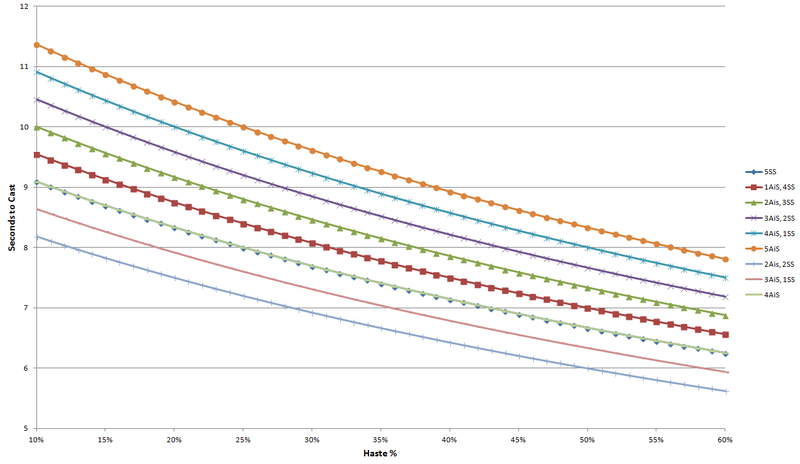 The second part is that haste plateaus suggest when the dps value of one point of haste changes. After a soft plateau and up to a hard plateau, the value of each point of haste is — in theory — more than the value of one point of haste after the hard plateaus. That’s because after the soft plateau haste is increasing the rate of your signature shot fire — in addition to all the Other Stuff: increasing auto-shots, increasing focus, increasing pet’s melee attacks, increasing pet focus. But after the hard plateaus, haste is still doing all the Other Stuff [Autoshots, pet Melees, RPPM, Focus regen, etc]. It’s just no longer also boosting your signature shot. Thus haste always increasing your dps, but at certain points it increasing your dps more than other points. The theory then suggests that the difference in haste weight was enough that it altered reforging priorities (by a small amount). And of course there is also the rotation break points. It is certainly still true that at different points, haste has different values. However, since in WoD we no longer have reforging, the only way we can affect our Haste is through gear choice, enchants and consumables, and since there are other, much more valuable stats that will be occupying our enchants and consumables, we're really not going to be thinking about getting extra Haste rating to make our way up to a particular point. Instead, we'll be focusing on how haste affects our rotation, and how to maximize our DPS, depending on our Haste percent. Just in case that's unclear: when I talk about Haste Plateaus, I am not, in any way, referring to the "break points" that healers have had to dealt with. I am, instead, referring to haste levels which will change our rotations, because it will become a DPS increase to either delay our signature shot, or include some down time in our rotation, to avoid delaying our signature shot. One of the big differences between MoP and Cata, which are primarily why we stopped concerning ourselves with Haste Plateaus, is the introduction of significantly more complicated "rotations", which really weren't rotations at all, but priority systems, which meant using our normal rotation went from a little under 50% of the time, to almost never. In some ways, that's a bit less true now, with the "ability pruning" came a much more simplified priority system. Though we're still using our level 90 talents fairly often, and our level 60 talents sometimes, there should be a greater number of occasions where your "rotation" will simply consist of your focus generating shot and your focus dump, during the CD of your signature shot. Over the next few days or so, I'm going to be going through the effects of Haste on our basic shot rotation for each spec, and seeing if I can't find some definable haste plateaus. My goal is to come up with some "areas of interest", where we can say "At X% haste, during Rapid fire I can do this; when when Barrage is off CD I can do this, when Crows if off CD I can do this.." etc. The way we're going to look at it is very simple. Using Marksmanship for example, we have a signature shot (an incredibly powerful one at that) in Chimaera Shot, which fall of my other shots will be based around. Subtract the GCD to cast Chim Shot from the CD (9 seconds), and that leaves me with 8 seconds to do as much damage as I can, while insuring I have enough focus left at the end to cast my next Chim Shot. Where it gets slightly more complicated (and the reason for making these guides) is: A. the function of my cast time is hyperbolic, not as a straight line, and B. even though I just said we're going to base everything around using our Chim Shot exactly on CD, we can actually get more DPS sometimes by not using it exactly on CD. In the end, no chart could ever make up for the well-honed instincts of a real hunter, but this should provide a bit of guidance so we can make informed decisions when presented with the varied challenges of of this new Draenor. Ive found that haste, while disdained by theorycrafting, was my top stat for a good chunk of MoP and, if 6.0 is any indication, will be high up in WoD. Being SV, Im focus-starved. My shots get pushed back because I have no focus to spend. Im forced to fire Cobra to get focus so I can use my big shots. I never sat down and figured out exactly how much haste I needed--Im certain I overshot a break point--just plugged in some haste gems and jumped into some dungeons. Too many Arcane shots? Switch back to another stat. Too few? More haste. I know why haste is devalued by spreadsheets. But my rotation feels smoother with more haste than theorycrafting says I should have. Also, Ive never been a fan of delaying big shots for any reasons. We're designed to keep firing, to keep those shots on cooldown. If one shot isn't buffed, oh well. Over the course of a 5-minute fight, we're going to fire a lot of shots. Delaying 1 or 2 seconds adds up to missing several big shots. Which does more damage, 40 buffed ES's or 50 buffed and unbuffed ES's? In practice, I'd go with the 50. Good reads :D Considering how terrible SV is in WoD, I may switch over, in which case I will come back here for help. I totally agree about Explosive Shot. It's made for spamming. Chim shot works a little different (it has a 50% longer CD than KC/ES, but well over twice the damage). But that's a really important question I want to look at. Conventional WoW wisdom says Always Be Casting, but it's yet to be seen if that's really the greatest yielding dps option. Oh also, I was in a Highmaul pug group last night with an SV hunter who was doing almost as much DPS as I. He even out DPS'ed me on kargath (though that may have been because I had some extra mechanic assignments). So I wouldn't trust SimC's evaluation of SV completely. Unfortunately, the guy only spoke Chinese, and since I didn't have many addons in the beta, I couldn't type in chinese, so I couldn't really ask him how he liked the spec, or how he was pulling out so much dps. I love playing SV, so I may keep it as a back up spec in t17, use it for farm runs and such. Even though we may be gimped a bit, a really good Survival hunter should do just fine in normal and heroic progression. That's great news! I love SV, and am really not excited about the MM mastery thing. Great article as well. Thanks!